Smarter bluish womp rats dive for cover while under attack on Tatooine. For those without comedic tastes, the so-called experts at Wikipedia have an article about Womp rat. Does the name womp rat conjure up notions of revulsion and stupidity? Hardly. Hero is more like it. Just consider this: In the Star Wars saga womp rats had moronically acted as practice-targets, which enabled star-fighter pilot Luke Skywalker to develop the skill needed to blow up the Death Star in episode IV. Without the specialized training that stationary and running womp rats offered Luke on Tatooine, there is no way he could bull's-eye a two-meter hole leading to the reactor while flying at ultra-high speed through an endless plastic alley with his sidekick robot R2D2 burned out, his targeting computer pushed aside, and obeyed a voice in his head while a forceful Darth Vader was hot on his tail. If Luke hadn't practiced hitting something the size of a womp rat at full speed and with no computer, things would have ended quite differently, and there wouldn't have even been episodes V and VI. And without those later episodes there would have been no demand for episodes I-III either. Besides, womp rats had no relationship with the evil Darth Vader, unlike Luke, nor do they have the hots for their sister - unlike Luke - so they are definitely not wicked. On the contrary, womp rats are both wiked and uncycled because they have their own page in Wikipedia and Uncyclopedia - making them more realistic than the vast majority of readers who are sentient and non-sentient beings respectively. 1 What is a womp rat? What is a womp rat? 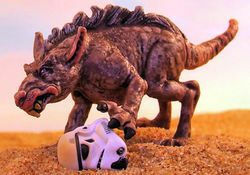 For anyone who doesn't already know, the "womp rat" is a disgustingly non-sentient extraterrestrial rodent-like beast, which dutifully serves as the primary target-of-choice for young star-fighter pilots on the desert-like planet of Tatooine, located within a binary star system in a galaxy far, far away. Accordingly, womp rats are of little concern in this galaxy, on Earth, or to Uncyclopedia. Still, because they have achieved inter-galactic fame even greater than Uncyclopedia, which is unknown on Tatooine, therefore they deserve a place of honor in the realm of science fiction balderdash. Womp rats are, by nature, docile, and usually stupidly stand still when being attacked - which makes them an easy target. Usually the smarter ones try to dive for cover. On Tatooine it has been noted by astrobiologists that smarter womp rats generally outlive the stupid ones. Although never actually seen in any of the Star Wars films, still you can be certain that Luke Skywalker has seen many a womp rat, otherwise he would have missed his most important shots. About the size of a donkey on Earth, they are covered in spiny grey-bluish fur, much like hairy fish scales. They are highly allergic to water, which, fortunately for them, is scarce on Tatooine. And it has been noted by extra-T biologists that the blue womp rats are more intelligent than the gray ones. Additionally it is seen that gray womp rats usually have two tails for enhanced absurdity. Orange womp rats are extremely rare and ingenious and they live primarily on a diet of lost storm troopers. 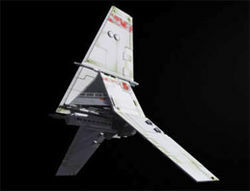 T-16 Skyhopper used by Luke Skywalker to "bull's eye" womp rats on Tatooine. 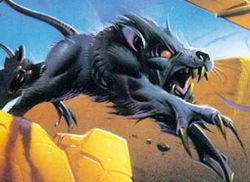 Womp rats are commercial by nature and live primarily off savaging royalties from Lucas Films, which, being in a galaxy far, far away, are few and far between. Therefore womp rats are basically starving. This accounts for their notorious and inordinately rude disposition, and their tendency to take large bites from, and big gulps of, royalties when they finally arrive. Previously unknown on earth, the womp rats of Tatooine only began to achieve inter-galactic fame when Sir Dr. Lucas released his Star Wars Report to the human race quite late in the 20th Century. But it wasn't until the publication of this Uncyclopedia article that the womp rat's fame reached its zenith. Womp rats! Those that live in the Dry-swamplands (Orange). 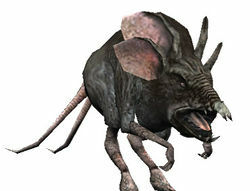 Occasionally it has been reported that people on Tatooine have domesticated womp rats as pets. But young pilots like Luke Skywalker will let them out of their cages and use them for target practice, or, better yet, while flying a T-16 Skyhopper fighter will target womp rats in their owner's backyard as they leap for frisbees or squeak at the mailman. Discovered by Prof. George Lucas and his extraterrestrial dream team in the late 1970s, Lucas was so disgusted by the creatures that he would not allow them to be named after him nor even to be seen in the franchise. Their name is derived from “womp” - the sound they make when struck by a blaster. This page was last edited on 15 February 2016, at 08:27.